A guide to all aspects of Safari Books Online including content, searching, and viewing results. Are you interested in the O’Reilly for Higher Education guide (the new interface)? If so, please use this guide. Short cuts provide deep coverage of a specific topic, usually in fewer than 100 pages. Safari™ Business Books Online delivers instant, reliable answers to both students and researchers. From problem solving and leadership to customer service and employee performance, these e-reference business books deal with a wide range of critical business skills. The database includes over 15,000 titles (January 2016) from publishers including Elsevier, Routledge, Wiley, Taylor & Francis. 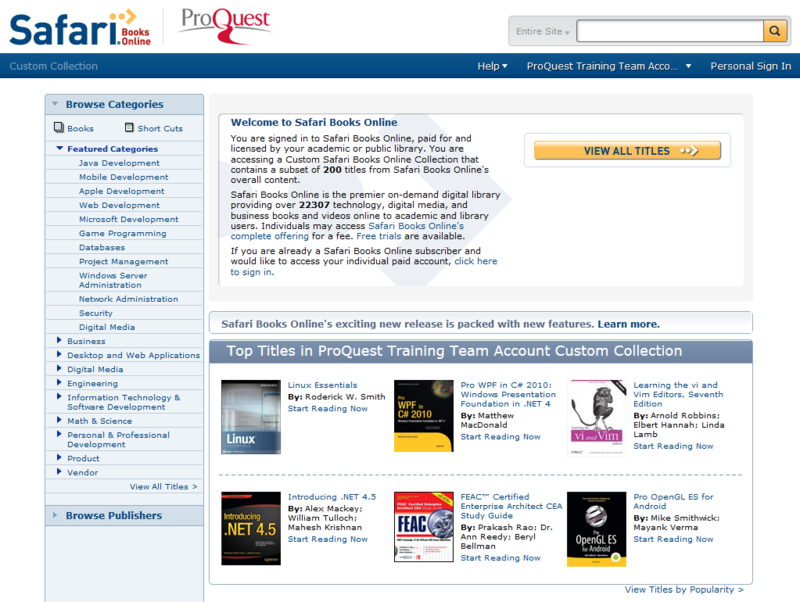 Safari™ Tech Books Online is the ideal ready-reference resource, providing a level of authority, flexibility, and currency unequalled by other online IT reference databases. Featuring over 30,000 titles (January 2016) from publishers including Microsoft, Adobe, Apple, IBM, O'Reilly. It covers the technologies most essential to users including certification, enterprise computing, Java, Linux/Unix, Web development, Windows, XML, and more. Users can search hundreds of books simultaneously online, quickly finding the information they need. View the latest title lists and publication coverage here.